Location: Forest Park Nature Center. 5809 Forest Park Drive, Peoria Heights. What? 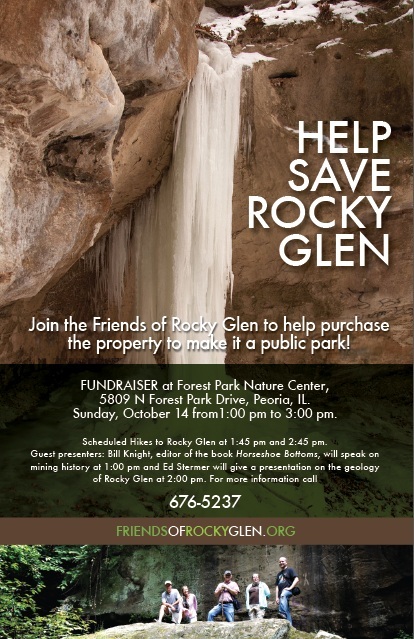 A Friends of Rocky Glen membership drive and fundraiser featuring presentations on Rocky Glen and hikes into the canyon. Bill Knight will discuss Horseshoe Bottoms, the acclaimed 1935 story of life on the Kickapoo Creek coal mines. Ed Stermer will outline the unique convergence of geologic forces that shaped Rocky Glen. Presentations start at 1:00 and repeat at 2:00 PM. Hikes leave for the glen at 1:45 and 2:45 PM. For more information, contact 676-5237.